10:1 Potency / 500mg / 180 and/or 60 Capsules per Bottle. Blue Poppy Originals are a unique line of complex formulas treating your patients who present with multiple patterns. Each formula is based on extensive research done by our herbalist Bob Flaws. This research is done both in the classical literature and in many contemporary journals. Clinically proven results from China represents the beginning of the development of our formulas which are then modified to deal with the complexity of Western patients. 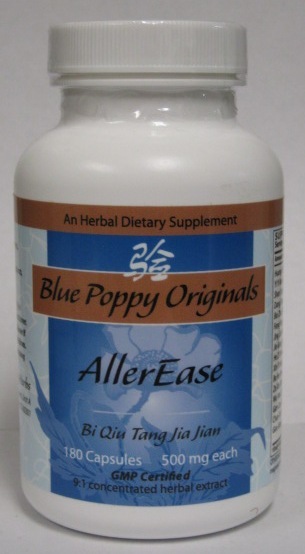 Blue Poppy Herbs capsule formulas are designed for the real needs of your typical patients. They are made from the highest quality desiccated extracts manufactured at a GMP certified facility in the People's Republic of China, and encapsulated and bottled at a GMP certified facility in the United States. These are 8:1 extracts or higher. All Blue Poppy Formulas are laboratory tested first in China and then sampled and retested again in an independent FDA approved lab in the U.S. to insure freedom from heavy metal and microbial contamination, as well as pesticide residues. This formula comes from Hu Ting-guang's Qing dynasty Shang Ke Hui Ji (Traumatology Compilation). Shi Yi Wei Wen Dan Tang Jia Jian.